The Porsche 959 (originally dubbed the Gruppe B) the was something of a flagship in the substantive history of Porsche products, at its time of release and sale on the public market, it was critically acclaimed for its performance, safety and cutting edge design as well as the exemplary technological features of the car. The 959 model not only served as a hugely popular and wide recognised sports car in its own right, and thus solidifying the already strong market presence of Porsche, but it was to serve as the founding blueprint for all future and subsequent sport cars. The 959 model was so cutting edge and so competitive that it had only one major rival the Ferrari F40, and even then the 959 enjoyed a very distinctively strong success over its peer and rival. The 959 was built as a racing car, and as such, the company lavishly spent unprecedented amounts of money on the creation and production of the cars. Whilst the cards sold for a rather hefty price tag, clocking at a substantial $225,000 each, the actual cost of production for each vehicle was closer to $530,000, which was a major factor for the very short lifespan of the vehicle. Whilst the 959 was a gold standard and epitome of engineering ingenuity and finesse, the vehicle was simply too costly for the company to maintain for a prolonged period of time, and it was with no small measure of regret that Porsche relinquished the model. Features such as electronic sensors contained within the wheels so as to detect whether there was pressure loss, and the strong design of the tires which meant that they were able to run flat for 50 miles even after blowout were innovations that set the 959 above the competition. 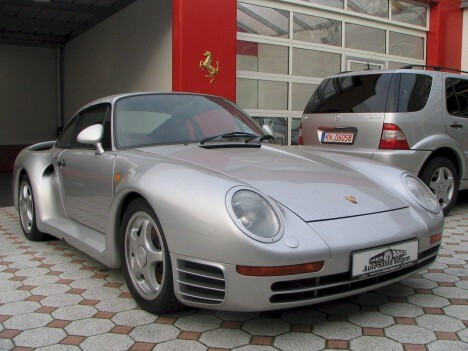 Curiously, production of the 959 model was rather short especially given the prolific success and profitability of the vehicle, but production ceased in 1989, with a grand total of 268 models manufactured, the company drew a close to the 959 model. Whilst the first models of the 959 were released for general sale in 1986, the 959 was originally conceived some 5 years previously in 1981 by the then managing director of the company, Peter Schultz. Schultz had a goal: to devise a sports car that not only would stand the test of time and serve to be popular both in the short term as well as the long term but that could also be easily and readily updated and upgraded as so required. Whilst this was ambitious in its own right, Schultz and his engineers also wanted to try a different approach with this new model, seeking to expand and develop upon the current rear engine as was in the 911 model. Other innovations included alterations to the wheeling of the vehicle. Another major innovation which set the 959 apart from its predecessors was the material used to create the car, making a shift from steel, to the more durable, lightweight and supple aluminium, this allowed for a major reduction in the actual physical weight of the car. This allowed for increased performance, primarily in the fields of steering, braking and speed. The wheel driving system was also the most advanced and sophisticated of its kind at the time, the driving system was capable of dynamically altering the torque distribution between the front set and rear set of wheels. This shifting of weight and torque was available both under normal circumstances as well as slippery, icy conditions i.e. generic situations where steering could potentially be compromised. This also helped to contribute to the strong safety record and reputation the 959 enjoyed.